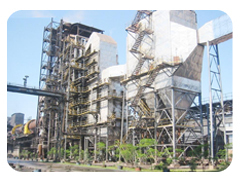 High dust content with entrained Iron Ore, Sand, Coal, Coal Ash and Lime Particle, capable of causing abrasion. For safe and efficient operation, all the above factors are to be considered. Based on our experience, we have selected the Boiler to meet the above condition. 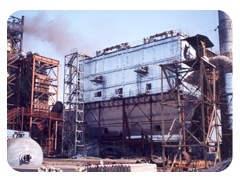 The Rotary kiln of Sponge Iron produces hot gases emitted by the Kiln at a temperature of 1000°C. Apart from hot gases, char in the form of "lumps" and fine particles of char are also produced by the kiln as byproducts along with the main product (i.e.) Sponge Iron. The fine particles of coal are generated during crushing of coal lumps. The char, char fines and coal fines have substantial calorific value which calls for their utilization for sake of economy. We propose to use them for thermal generation of electricity through conventional steam cycle. 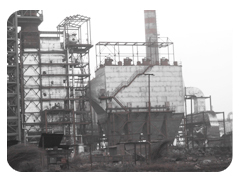 Due to substantial quantity and temperature of the Waste gases from the Rotary kiln, it is also considered desirable as well as feasible to recover considerable heat from the waste gases emitted from kiln by installing Waste Heat Recovery Steam Generator (WHRSG) behind the Rotary Kiln. The temperature of the Waste gases at exit of WHRSG will be limited a value high enough to ensure freedom from condensation of SO2 content of the gases. 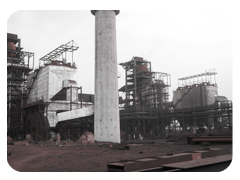 The hot gases emitted by the Sponge Iron Kiln contain Iron Ore in the form of fine particles. To avoid deposit of Slag on heat exchange surface, the WHRSG will be designed with bare tube construction.